The following interview was conducted in 2016 for the occasion of Music & Literature no. 8, which gathers over 150 pages of new and newly translated texts by and about Éric Chevillard. A complete listing of that volume’s contents can be found here. The illustration by Jean-François Martin that originally appeared alongside Chevillard’s piece on Patrick Modiano for Le Monde des livres. Courtesy of Jean-François Martin. There are some writers who measure their work by the sentence. Each one must have its effect, be it poetic, humorous, dramatic, or euphonious. It may dovetail with the sentences around it, but it stands on its own as well, ready to be isolated and quoted. There are virtually no filler sentences for these writers, workmanlike sentences meant only to move the plot forward. Their art is as painstaking as that of the iron craftsman. Secretly, they would like to tool each word, each syllable, perhaps even each letter, at their leisure. I have a feeling you’re actually talking about yourself here, about your own relationship to sentences, to words, to each letter (I’m thinking, when I type “each letter,” of your Disorder According to QWERTY, and when it comes to humor I could list practically everything you’ve written, but at the moment I’m thinking of two little texts published in this magazine, “Peter and the Wolf ” and “Moles”). I’ve never found a single “workmanlike” phrase in your oeuvre. And almost every single one manages to be poetic, humorous, dramatic, and euphonious. Do you have a hierarchy for all that, by which I mean do you specifically favor poetry, humor, drama, or euphony in your own fiction? Or do you need all of it, all the time? Éric Chevillard: “All of it, all the time” would be a fine writer’s motto, wouldn’t it? Why should I give up anything in a terrain where everything is possible? The nuances you mention are also relative to one another: euphony gives rise to poetry, drama can produce an oddly humorous effect. You’re right to think that I’m describing, in the beginning of that article, if not necessarily the writer I am, certainly the sort of writer I favor. I do realize that true novelists must occasionally resort to expedient sentences—the merely informative, the utilitarian, the economical—these can be found even in the greatest writers’ work. I’m also conscious that a book isn’t a firework display, that sometimes an author must unobtrusively describe a quiet interior, plainly render a trifling character, evoke impressions, a subdued ambiance where any stylistic flourish would be an unwanted cymbal clang. In the end, I suppose a skillful assembling of hollow sentences could somehow bring order to a lactescent globe. All the same, I fear boredom more than anything, and only surprise can keep it at bay. Literature that delicately depicts our existence holds absolutely no interest for me. To please me, literature must dream up new situations, which of course can only be language acts to begin with. Your imagination seems bottomless, inexhaustible. I can’t imagine an Éric Chevillard who’s actually bored, nor a Chevillard reader who’s bored. “All of it, all the time” could also easily describe the many genres you work in: novels, short stories, reviews, essays, blogs. Does this wide variety of genres also come from your fear of boredom? It’s only a slight exaggeration to say that form is incidental or happenstance for me, that I feel alive only while creating text, whether it results from a commission or from the beginnings of a project in the format of this or that genre. Like doctors, there are specialist writers—novelists, essayists, poets, aphorists, etc.—and generalist writers; I’m one of the latter. My response to concerns, challenges, crises, all the various events of life, is a written response. Not exclusively, of course, but it’s rare that I don’t feel a need to confront in writing the things that happen to me, to consider them in that manner. It’s a way of not being hoodwinked by the fate I’ve been given, a way of regaining the upper hand. However, I don’t have much imagination. I know some of my novels are wild enough that people might think I do, but it’s not so. I think of the imagination as a sort of mental space in which some writers move around effortlessly and meet their characters, the people in their stories—all of which precedes the moment of writing. As a result, their books are like dispatches sent from this interior country. None of that is true for me. Everything comes together in my sentences, in the moment of their writing, driven by a hopscotch logic, by syntactical deductions. My stories are born out of sheer energy. The typewritten first page from a working manuscript of Dying Gives Me a Cold, the debut novel by Éric Chevillard. Courtesy of the author. The beginning is always a feat of willpower. I’ve often had to deliberately set down—like an absurd premise, an indefensible principle—a first sentence so bizarre that it opened up a wholly unexplored space. At least then I could be sure I was the first to land on this shore, to tread on this snowy stretch. I remember very clearly the moment when I started my novel On the Hedgehog by writing these words: “It seems exactly like a naive and globular hedgehog, this animal, there, on my desk.” It was practically automatic writing. I didn’t yet have any specific aim. But the impetus was there. I will maintain that any other formulation could have served my purpose just as well. It’s a matter of surprising myself in order not to repeat those worn-out phrases that have not only been put to use already in literature, but also come to dictate our very existence. I believe that art in general and literature in particular offer us the chance to broaden the range of our awareness as well as our areas of experience, to leap from a moving train of thought as if to free ourselves from the specific conditions imposed upon us. So the first words count quite a bit; here the words really do give the orders. If a writer isn’t careful he will innocently formulate the words that already dictate the world, whereupon everything will start over as it always has and, as Beckett puts it at the beginning of Murphy, the sun will shine “on the nothing new.” A mysterious or extravagant first sentence must, on the contrary, be justified. A different world order must be invented in which it makes sense. This reminds me of Xenophanes: “But if cattle and horses and lions had hands or could paint with their hands and create works such as men do, horses like horses and cattle like cattle also would depict the gods’ shapes and make their bodies of such a sort as the form they themselves have.” But let’s get back to our sheep, as the French would say, which in your works are moles, crabs, orangutans, rabbits, hedgehogs, horses, and so on. Why all these animals? So you can depict other “characters” than humans? I read somewhere that you began to write when you were eight years old. And now you also write children’s books. Do you have any memories, or even copies, of the first things you wrote when you were a child yourself? Has the fact that you were a child who wrote helped you at all, in the years since, to become a children’s author? It’s odd, this youthful desire to write, because it is born from the pleasure of reading. For once—perhaps once and once only—the desire derives from the pleasure, not the other way around. My attempts were extremely naive. Almost nothing is left of them, just a foolish poem and a very melodramatic little story I wrote later called “Revolt in Bucharest,” which I discuss in Disorder According to QWERTY. Children make terribly mediocre children’s authors because they don’t have the storyteller’s authority or the writer’s artifices. Stories must be told by older people. By a grandfather, ideally. If he has a long white beard, so much the better. From when I was fourteen or fifteen years old, up until the earliest drafts of my first novel, Dying Gives Me a Cold, each year I would furiously destroy what I had written the previous year, my newfound maturity having made me ashamed of it. Sometimes, fortuitously enough, my reptile brain dredges up a knockoff Baudelairean or Rimbaldian verse from when I was sixteen. All of it had to go, but I could easily spend several hours with those old papers today, simply out of curiosity about the child I once was. I have written two books for children, specifically for my daughters; those will perhaps be the only ones. However, I’ve just finished a short novel meant for adults, Bramble-Rose, whose narrator is (let’s say) a nine- or ten-year-old girl. I didn’t want to use childish language, but I do play with the logic and the thought structures of childhood. I draw on the unintentional daring that comes from the lack of means, of words, of maturity—I try to write from that space, where clumsiness is grace, where complete ignorance verges on absolute truth. Ideally, I’d like this book to call to mind those paintings by Klee or Dubuffet that were inspired by children’s drawings. While we’re on the subject of paintings, you’ve written a book about Gaston Chaissac (Full Force), and you used a quote of his as an epigraph for Prehistoric Times (“Only cave paintings seem made to last forever.”). “I consider the attitudes of Chaissac, Beckett, and Michaux wholly exemplary,” you’ve said: “I refer to them the way others would to the lives of saints.” Why those three? Sans titre, by Gaston Chaissac. March 8, 1952. 18cm x 13cm. Watercolor and collage on paper. The piece appeared in Chevillard’s Full Force. Courtesy of the Collection Musée de l’Abbaye Sainte-Croix, Les Sables d’Olonne, and photographer Hugo Maertens. Beckett and Michaux were beholden to nothing. They were never bound by the demands of the system, its necessities or laws, and they never surrendered or conceded a single thing, doubtless because they had no need for fortune or glory and because the only thing that mattered for them was to create, through writing, the conditions of a life that was possible in spite of everything. Beckett and Michaux instilled shame in us like a righteous punishment, like a painful realization of what we have become. Writers these days clearly have no idea the extent to which they’re compromised. As for Chaissac, the figures he painted are always grinning in their agony—on the bottom of a basin, on the walls of his cave. He responded to everything that happened to him by painting. Beneath his naive appearance, he was nobody’s fool. His figures also seem made to last forever. Since this magazine is called Music & Literature and we’ve been talking about literature and painting, I think this might be a good moment to ask you about music. I noticed that you said, on the website Les surgissantes, that you enjoy Dvořák. Could you share your thoughts about that a bit and maybe also tell us about other composers and pieces of music you enjoy, and why? To be completely honest, I especially love Dvořák’s Slavonic Dance no. 10 in E minor, which I find utterly heartbreaking; its beauty seems almost perversely bound up with its sadness. But I’m not much of a music lover, I’m afraid. Opera bores me quickly, symphonies often strike me as pompous, and I don’t understand much about jazz or rock. Of course, there is Chopin, Schubert, Satie, but it’s their tone I respond to, the same the way I like the melodies of songs. Music that can be hummed, whistled. Nabokov said he couldn’t go to a concert without becoming enthralled immediately by “visual impressions, reflections of hands in lacquered wood, a diligent bald spot over a fiddle”; that’s how it is for me as well. Many writers take music as a model, shaping the rhythm of their sentences as if they were composers. I feel more of a kinship with painters or illustrators in my way of progressing clause by clause, accumulating details, subtle effects, linkages. But I’ll sometimes edit and rework my texts while listening to Philip Glass—his repetitions, his energetic bursts. There’s a sense of movement in his music that hypnotizes and exalts me, and into which I can weave my sentences. Peter and the Wolf is an absolutely charming piece of music; children always love it, my daughters especially. I gave free rein to my rebellious side in that little text because Peter and the Wolf might be a little too well known, frankly—it’s really foisted upon us as children. But don’t go looking for serious polemical or critical intent in my piece, nor even the retort of a writer afraid that the expressiveness of the music will overwhelm the power of literary storytelling. In some of the short texts I write, I’ll advance by means of amplification or acceleration. I prefer pushing the logic at work in any given situation to its extreme, whether that logic has been provided to me, as in the case of Peter and the Wolf, or I have to invent it wholesale. For “Peter and the Wolf,” I merely pushed the envelope of Prokofiev’s argument—an exaggeration which proves that comedy results from excess, and that any human scenario or achievement is always on the brink of absurdity. Balance, law, and perfection are always threatened by the very effort that went into creating them, which is only suspended for a time. What we call reality may simply be the product of wise or cowardly denials, of wary consensuses. It is literature’s responsibility to liberate these suppressed forces so that our experience may be complete and unconstrained. In this respect, contrary to popular belief, we can say that we’re living in a virtual world that is fulfilled only in the works of the mind. Quite simply: we live in a fiction; literature alone is real. If it’s true that literature alone is real, what relationship are you hoping for between your “reality” and that of the reader? And what response are you hoping for when it comes to your work in the long term (given that “Only cave paintings seem made to last forever”)? I have no intentions for my own readers. Better to ask them what their own intentions are toward me and what they intend to do with my books down the line… The figure of the reader is nonetheless present in my books, as one of the characters—the most unpredictable, to be sure. He’s tangentially involved. I need him to illuminate those tiny enigmas of mine, page after page, in order to move forward in his reading; without that, it would be pointless for me to continue writing the book. But, joking aside, readers are indeed involved in my books, and I count on them—no less on the welcoming reader, who can be a sort of ally, than on the malicious reader, a sort of enemy. It’s a matter of neutralizing the latter with the help of the former. Were you really thinking of an eventual translator when you were writing these lines? I took you literally and I inserted a footnote of my own (on pp. 37–38 of the English translation). That was a humanitarian act on your part, a very clever one! Without your narrator’s explicit permission, I’d never have dared to do it… But, joking aside, what do you think of translation, both in general and of your books in particular? Have you ever translated? No, I wasn’t really thinking about an eventual translation when I wrote those lines, as far as I can remember: it was rather a little bout of vanity with a touch of self-deprecation. Nabokov does tip his hat to his beloved re-readers… I’ve never translated anything myself, sadly unable as I am to read a literary text in any language besides my own. But I feel infinite gratitude for translators, those people who are as gifted as the writers they translate but devoid of presumption and petty ambition (the sole way in which they are distinct from authors). Translators manifest a genuine delight in writing even as it brings them no dividends in fame nor even, much of the time, in rightly earned recognition, for they mostly remain obscure. I was talking about Nabokov earlier—what talent and finesse his translators must have needed to render in French the subtleties of his English covertly informed by Russian! Or Claude Riehl, who reinvented Arno Schmidt in French—itself the labor of a prodigious writer—and who died before completing the task. Naturally I wish no such misfortune on the translator who seizes upon my texts… As I’m unable to evaluate his or her work, I leave him or her to it with my full trust, as though submitting myself to a laryngologist whose care I can neither judge nor appraise. All the same I know, one way or another, that the procedure is a kind of cure: it enables me to speak where I otherwise would be silent. How could I not be deeply moved? Éric Chevillard published his first novel, Mourir m’enrhume (Dying Gives Me a Cold), at the age of twenty-three, and has since gone on to publish more than twenty works of fiction, including The Crab Nebula, On the Ceiling, Palafox, Prehistoric Times, Demolishing Nisard, and The Author and Me. Alyson Waters translates modern and contemporary French and Francophone literature. In 2012, she won the French-American Foundation/Florence Gould Foundation Translation Prize for her translation of Éric Chevillard’s Prehistoric Times. She teaches at Yale University and lives in New York City. Jeffrey Zuckerman is Music & Literature’s Online Editor for Literature as well as a translator from the French of pieces by Ananda Devi, Hervé Guibert, Kaija Saariaho, Jean-Jacques Schuhl, and Antoine Volodine. 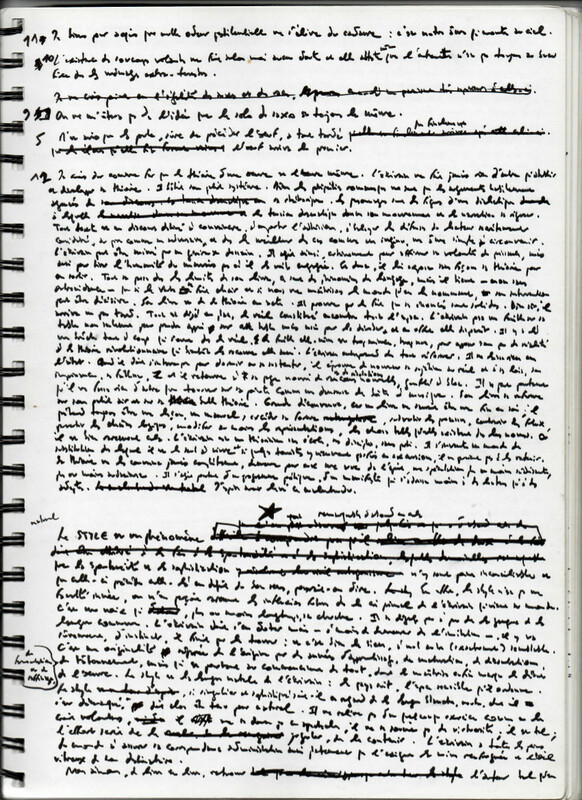 Banner image: an image by Jean-François Martin, originally published alongside a piece of literary criticism by Éric Chevillard in Le Monde des livres. Courtesy of Jean-François Martin.